“Banjo Nickaru & Western Scooches brings Cajun Jazz, Blues, Gospel, and Americana roots together in a way that inspires an emotional reaction. I’ve seen a million live shows, and Banjo Nickaru is one of the best live acts I’ve ever seen; up there with early Springsteen, early Counting Crows, and Langhorne Slim.” – industry veteran Pat O’Connor. “I’m so impressed! They really took it to another level. Live these guys are extraordinary. It’s just magical, the proficiency and the expertise. Getting up on stage with them at the end for that Finale was like going to church! It was pretty cool!” – Rob Morrow, Emmy/Golden Globe nominated actor, and opening act. Celebrating their new album “Get Us Out of Fearland” which No Depression dubbed, “Americana music at its purest and most impressive,” this was the first time all of the musicians on the album had a chance to gather together, their combined energy and styles creating unique moments for each song. The show started with singer Betina Hershey, banjoist Nick Russo, and percussionist David Pleasant playing acoustically through the audience and onto the stage with a song reminiscent of the 1920s and New Orleans. 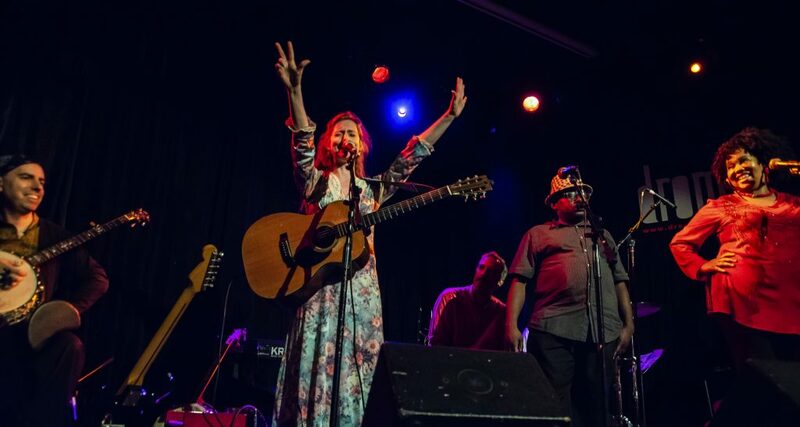 Other unique moments included the power of “Dandelion,” with Hershey’s soaring vocals and the aching and celebratory gospel vocals of Stephanie Rice and Miles Griffith singing “break down that wall!” “Run,” dedicated to victims of gun violence, featured the core duo with Hershey’s light fingerpicking and Russo’s banjo played as a drum. The band’s rollicking rendition of “A Hundred Miles,” a train tune from the 1800s, featured fiddle veteran Kenny Kosek. Closing the show, Banjo Nickaru & Western Scooches brought up everyone from the entire night, along with special guests, for their sing-a-long “Park Song” and “This Little Light Of Mine” with David Pleasant’s Gullah-Geechee rhythms and shouts rising above.